blitzTag is a projection software suite inspired by LaserTag, which was originally created by Theo Watson. It has a relatively easy set up that enables users to be more flexible and spontaneous regarding location. 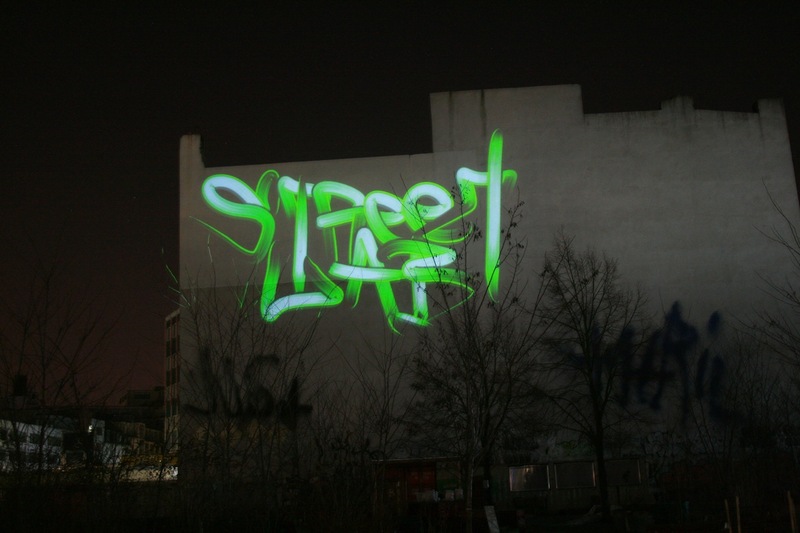 Creating visuals with a laser pointer, blitzTag is best suited for Tagging, Writing, and drawing simple designs while giving the impression of drawing directly onto a wall or surface. BlitzTag is often used in combination with the Light Rider, our mobile audio-visual projection unit. Dedicated Nvidia Graphics Card (the faster the better) and current drivers: we get ~30 fps on a GTX330m, 60 fps on a 460m. Camera… For smaller setups a PS3 Eye-Cam gives good results. If you use a PS3 Cam makes sure to use this driver. For larger setups, we recommend a Firewire DVCam, or, if you have a capture card, a security-grade USB camera, as this will allow you manual zoom and iris control. Projector. For outside events, we recommend at least a 5K ANSI Lumens unit. We’ve used from 5K to 9K to 22K… Really depends on your wall and logistics. For source code editing/browsing, Processing 1.5 with Android SDK – instructions here. You need OscP5 and APWidgets Libraries, installed according to these instructions. To install the APK, download the file, connect your phone to your computer, and put it on the SDCard. It will require the permissions “Internet” (for OSC communication) and “Vibrate” (for haptic feedback). The remote has been tested on a variety of devices, from OS 2.1 to 2.3, but please comment here if you have issues. Defintiv eine großartige Idee, eure ”BlitzTag” maschine ist der Hammer, vielleicht kriege ich es hin es in klein nachzubauen. Respekt an euch und daumen hoch das Ihr das Wissen teilt!! Bis dahin möge das Licht mit euch sein..
something about the mac version???? Unfortunatly as long as there will be no mac version of Touchdesigner, there will be no mac version of blitztag. Sorry. I met with Derivative in Toronto recently. The whole thing that is holding them up is that Apple isn’t yet on OpenGL 3.3+. But with OSX 10.9 coming out, they are moving to OpenGL 4.0, so the current timeframe is for Derivative to make a Beta of the Mac port around December. We will be beta testers, and blitzTag will be one of the first things we test… will advise. Will the app work on android versions 4.0 and above if i want to run it?? Can this ApK work on android 4.0 that is Ice Cream sandwich and above? Yes, the app should run on > 4.0 though it was compiled using the 2.3 SDK. Keep your eyes peeled here, there may be an update soon. funktioniert das blitztag auch mit anderen grafik- karten?